Commander Suresh K Maurya hailed form Sultanpur in UttarPradesh. He passed out from the Indian Naval Academy in Dec 1991 and later got posted to INAS 551 at INS Hansa, Goa, in Jan 1993. Cdr Maurya was very passionate about flying and was extremely happy when he got selected to be trained as fighter pilot in the Navy. After completing his rigorous training Cdr Maurya earned his wings and became a Naval fighter pilot in Jun 1996. 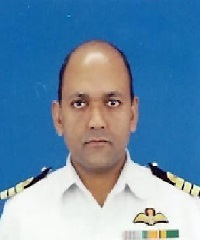 Cdr Maurya soon grew into a professionally competent pilot and gained enough experience and expertise to get inducted into the Naval Aerobatic team “Sagar Pawan”. The Indian Navy aerobatic team Sagar Pawan was formed in 2003 at Dabolim Naval Air Station in Goa, and the first demonstration was planned in May 2003. The team flew four HJT-16 Kiran Mk.II planes attached to INAS 551 Squadron, painted in dark blue and white. 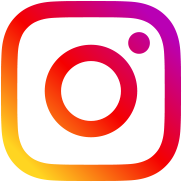 The planes used white, red and blue smokes. Cdr Maurya besides being an ace pilot, was an excellent swimmer, cross country runner and a painter. In March 2010 , the aerobatic team “Sagar Pawan”, was tasked to perform in an air show in Hyderabad. On 3 March 2010 one of the Sagar Pawan Kiran Mk. II planes being flown by Cdr Maurya and co-pilot Lt Cdr Rahul Nair crashed onto buildings, as they were doing manoeuvres during the show. The accident occurred at Bowenpally area near Begumpet airport of Hyderabad . When all the four planes of the “Sagar Pawan” were performing ‘downward bomb burst’, formation, the aircraft being flown by Lt Cdr Nair and Cdr Maurya failed to pull up and crashed onto the buildings. Both the pilots were experienced and competent flyers who had flown various operational missions before. But due to some technical snag, they could not control the aircraft at the mission critical moment and crashed on to the nearby buildings. Lt Cdr Nair managed to eject from the aircraft, but did not survive as the plane had come too close to the ground for a safe ejection. His parachute didn’t open up fully and got stuck in high tension electric wires, proving fatal for him. 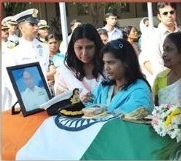 Cdr Maurya did not get time to eject and his body was found in the wreckage of the aircraft. Cdr Maurya was an accomplished fighter pilot and a committed soldier who laid down his life in the service of the nation. 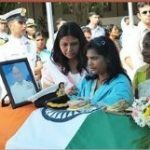 Commander Suresh K Maurya is survived by his wife Archana Maurya.